In recognition of the unique threats that climate change poses to Northwest tribes’ natural and cultural resources and treaty rights, the Northwest Climate Adaptation Science Center (NW CASC) is committed to working with tribes that have reservations or natural and cultural resource interests within Oregon, Washington, and Idaho. The NW CASC’s interest in fostering lasting partnerships with Northwest tribes extends to all aspects of our work, including science planning and implementation, the allocation of funding for projects, and the creation of training and education opportunities. To better understand, communicate and promote climate resilience in Northwest tribal communities, we are partnering with the Affiliated Tribes of Northwest Indians (ATNI) to host a Tribal Climate Resilience Liaison. The liaison helps build tribal capacity for addressing climate change impacts on resources and practices of importance to individual tribal groups (including, but not limited to first foods, cultural resources, traditional practices and tribal rights), and provides support to tribal governments for developing climate vulnerability assessments and adaptation plans. The NW CASC is continually seeking ways to expand and improve engagement with tribes. The NW CASC is invested in helping NW tribes evaluate how their resources and ecosystems are affected by climate change. Traditional Ecological Knowledge > Since its establishment in 2011, the NW CASC has funded a dozen projects focused on the vulnerabilities of culturally significant tribal resources including plants, berries, shellfish, lamprey and eulachon. Many of these projects incorporated and prioritized the use of Traditional Ecological Knowledge (TEK) to help assess changes in resource availability and inform management decisions. Blending TEK with western science represents a unique opportunity for understanding the connected social, cultural and natural resource impacts of climate change. Vulnerability Assessments > In working with NW tribes to understand their capacities to address climate change, tribes have expressed the difficulty they experience completing climate change vulnerability assessments, an essential and early step in the adaptation planning process. To address this challenge, the NW CASC partnered with the Great Basin Landscape Conservation Cooperative to fund the University of Washington Climate Impacts Group to make the vulnerability assessment process more accessible to Northwest tribes. This work has resulted in online guidance materials for tribal audiences and a Tribal Climate Tool that delivers climate data at the appropriate scale for tribal decision-making. This work also supported tribal staff through the vulnerability assessment process via hands-on workshops and webinars, and continued staffing of a Tribal Climate Technical Support Desk. Since 2016, the NW CASC has helped organize and participate in our Tribal Climate Camps, in collaboration with the Affiliated Tribes of Northwest Indians (ATNI), Portland State University’s Institute for Tribal Government (ITG), United South and Eastern Tribes (USET), the Nez Perce Tribe, the Nisqually Indian Tribe, Michigan State University, University of Idaho, and the Bureau of Indian Affairs (BIA). The Tribal Climate Camps bring together teams of tribal leaders, tribal staff (climate change coordinators, planners and program managers), tribal liaisons, delegates from the United Nations ITAR, BIA interns, and tribal Americorps members, for one week to share information and build capacity amongst tribes to address climate change. The Tribal Climate Camps are an important part t of the NW CASC’s commitment to work with tribes in Oregon, Washington, and Idaho. We will continue to work with our partners to deliver high quality programs for tribal participants in the future. Planning is already underway for the 2019 Tribal Climate Camp; please check back for additional information. Power Paddle to Puyallup, 2018. 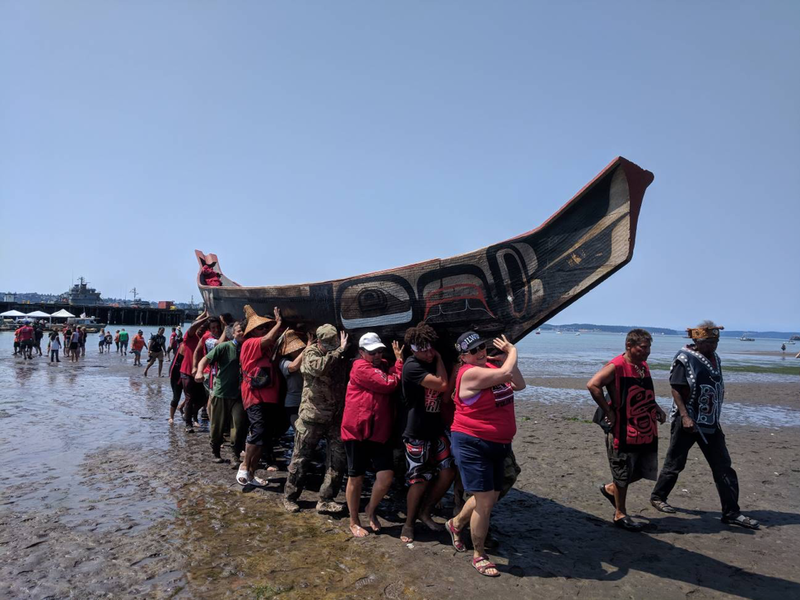 After landing, each canoe was carried above the high tide line by up to 50 volunteers. Credit: Chas Jones, NW CASC Tribal Climate Resilience Liaison.